← How to extract French table in PDF to Excel? VeryPDF ePub Creator allows you to add a cover to each epub file when convert PDF to epub. Some users may prefer to specify an image as the epub cover, though the iBook will add a simple cover by default. VeryPDF ePub Creator allows you to define cover, font color, page margin for the output epubs. Multiple input formats are supported: PDF, HTML, DOCX, PPT, XLS, CHM, TXT, RTF. When add a epub cover, you can also put the title and author on the cover. VeryPDF ePub Creator also runs well on Mac and PC. If you are a PC user, you can also use VeryPDF ePub Creator to import the epub you are making into iTouch, ipad, and iPhone directly. This article explains how to use a command line to create epub from PDF, and specify an image on your local disk as the epub cover on PC. The first book on the bookshelf as shown by the screenshot below is the epub with the user defined cover. The second one is the epub with a default cover added by iBook. Press the Windows key and R to open the Run dialog box, where you can then type cmd. After that, press Enter to open the Command Prompt. veryepub.exe calls VeryPDF ePub Creator . 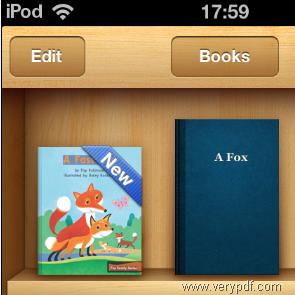 -cover c:\ fox.tiff specify the image named fox in the root file of disk C as the epub cover. d:\source.pdf is the input PDF file. e:\output.epub export the output epub file to disk e.
There are more options you can use to set epub. If you are interested, please contact the Support Group of VeryPDF to send the beta version of VeryPDF ePub Creator to you. This entry was posted in Promotion and tagged epub converter, epub creator. Bookmark the permalink.